1. Any comments on these traps? 2. Was watching a video on Youtube where a trapper suggested to put moth balls in the run (one on either side of the trap). Said the moles would be motivated to push it out and thereby more likely to set off the trap. In another thread, it was said that moles will avoid new things or changes in their environment. Moth balls, yeah or nay? Because they are built cheap or because other traps work better? Is there such thing as a trap that is better for newbie's to catch moles? Looked at your site. Is that the Victor OOS you use? The trap you have pictured is more time consuming to get it set and placed in run. I personally would not use mothballs for any reason unless you want to scare away moths. I will be demonstrating setting of OOS at wct next month..hoping to figure out a way to get a big flower pot with dirt in it to set trap in and show how i build a dam as well as how i modify an OOS for a crisp let off. Plus will focus on location of traps as well as marketing/advertising with emphasis on tradeshow marketing. Would love to attend your workshop at WCT, but I'm as good as a million miles away. Haven't pulled one out of the ground yet, but apparently we've got Coastal and Townsend's Moles here. Other than size, do all moles behave the same? Will moles cut through that nylon mesh that holds turfed grass together? Probably not. They're just fine running below it as that's where their food is. It sounds like meadow vole behavior. We have eastern, hairy tail, and the starnose here. They have different behaviors, but are caught in the same way. Definitely a mole. Didn't measure it, but one mound 2 feet from our property line had to be at least 8" high. I'm wondering about the mesh in the turf--how easy it would be to find a run in a lawn turfed that way? Would moles live in an place like that? The ground is very soft, so maybe they are just pushing the soil to the side underground? Making tunnels to the neighbors where the obvious mounds are? I suspect there are moles because the ground is soft and I've noticed that there are often very small mounds (2" in size) beside worm castings. I'm thinking a mole had to do a bit of excavating and pushed up a small bit of soil through the mesh. Those rolled down lawns are a challenge to trap and to read good solid sign due to the conditions that the new sod gives you. I have seen lots of those lawns over the years in this new construction on these what I call instant houses. Generally what happens is there is very minimal top soil usually under the sod which doesn't allow the moles to tunnel real deep in many cases. More clay and small gravel in the soil around these parts when you do find these conditions. Like you stated the sod used around here from the builders come from Nurseries that cut and roll up the sod and transport it. Others have the mesh in it or it is laid down on top of the soil graded area to help the roots grown into the mesh to hold it in place better. when you have new turf put down. got to go to the edges, pull that new sod back and look for tunnels going along the edge or where the tunnel enters in from outside the turf. those are kill spots...trying to set in the middle will make ya lose sleep at night. The sod has been down for a year and half now and there was topsoil added on top of the ground that was already there, so there should be a pretty good base. TRapper, there are no edges to pull up. I see lines of very small mounds (2") near the concrete patio, which may be their runs. When the weather gets a bit better (been raining like crazy), I'll start doing a bit of digging. I'll also ask the neighbours' if I can trap their yards. Likely the same moles. Do you have any starnosed moles up there. I frequently see smaller in line mounds at times that I have found are made by them. Also ground or area conditions may be that is all that is needed to clear a tunnel is by heaving smaller mounds vs the larger ones more commonly seen by deep burrowing mole activity. It is also less work to create and clear a tunnel with smaller mounds. Or the surface break conditions may contribute to this effect. This is under sod that's held together with nylon mesh. I didn't think it was moles. But we will find out when the weather gets a bit better and I start digging! Do you have any starnosed moles up there. . I'm still deciding on what traps to get. 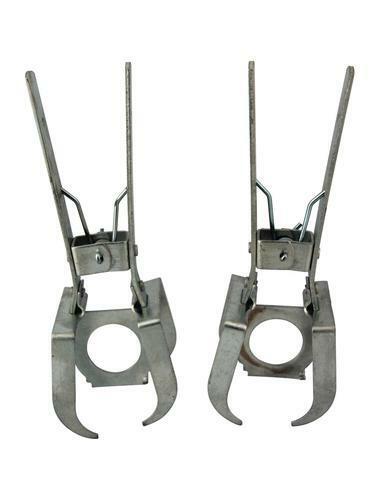 Semi-local company selling the traps pictured above, figured they'd know all there is to know about the locals, but they've been tardy in answering an email I sent them, so am questioning post-purchase support. Will go with the Victor OOS if I don't hear from them soon. A good community here and I know I'd get help if I needed it. All the info is much appreciated! I would go with the advice you get from the people that use the trap. Also there are people on this site that sell the trap you need and know how to use them. Some of the guys on this site catch K of moles a year. I hope I didn't sound disrespectful. I have no doubt that the trappers here are pros at what they do. If anyone thought that, my sincere apologies! I thought I may need 'local knowledge'. But I am heading out tomorrow to get the Victor OOS. Good info here to start and will post again when I run into trouble. The book I'm reading about moles in our area says the moles can feed without making mounds--they just push the dirt aside as they 'swim' through the dirt. Would seem possible considering how soft some of the ground is in our yard.. I know we've got some big worms feeding in our lawn due to the size of the castings and there is something else digging beside them. I don't think it's insects--I don't think we have bugs here that will make that kind of mound. I'm looking forward to the challenge! Will update when there's news. Where are you finding the oos and what are they costing you if you don't mind? Have not been able to find them for a while.. The only place I can find them locally are at the big box hardwares. They are around $17 CAD.